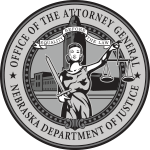 The Nebraska Attorney General's Office publishes a variety of booklets to provide valuable consumer resources to the public. You may also wish to download digital versions of the brochures available below. Thank you for your interest in our publications. 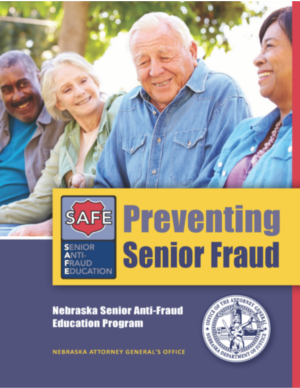 This brochure was created to help prevent the victimization of Nebraska seniors by arming them with tools to guard against consumer fraud. Anyone can become a victim of identity theft. Unfortunately, many victims do not even know they are victims until their credit is destroyed. 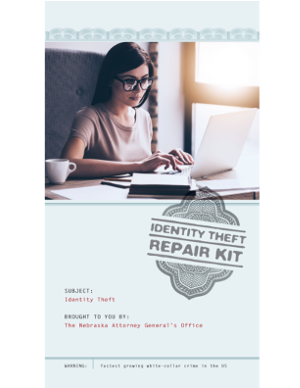 The effects of identity theft can be devastating, and that is why it is important that you understand how to detect identity theft and repair your credit. To minimize the damage done to your name, you must take immediate action. The goal of this handbook is to arm you with the tools you need to do just that. Please use it to guide you through the steps to repair the harm done by identity thieves and prevent identity theft in the future. Want to stop those annoying phone calls? The Federal Trade Commission’s (FTC) National Do Not Call Registry gives you an opportunity to limit the telemarketing calls you receive. By registering, you make it against the law for most telemarketers to contact you. 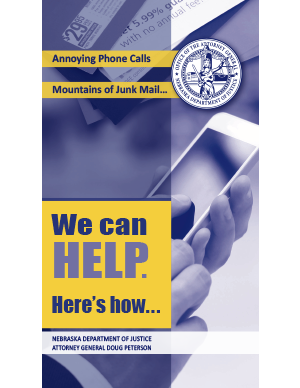 You can register your landline and/or cell phone for free. This brochure will guide you through the registration steps. If you would like to request a copy or copies of any of the above mentioned materials, please feel free to contact us.